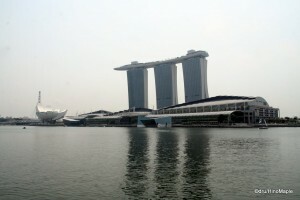 Singapore is a small country that has been influenced a lot by history and outside forces. It can be argued that Singapore was born in the early 1800s when England established a colony in the area. It was governed by England, with a brief Japanese rule during World War II until the 1960s when Britain allowed Singapore to merge with other countries to form Malaysia. This lasted only 2 years before it was made completely independent. It has since flourished and grown as a distinct country on the southern tip of Malaysia. 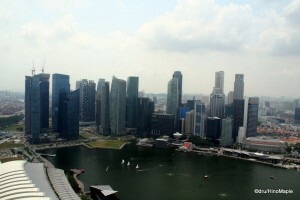 Singapore is a very small country that can be related more as a city than a country. It is well known for its crack-down on crime with stiff punishments. Even so, Singapore is a very clean country that is very multicultural. 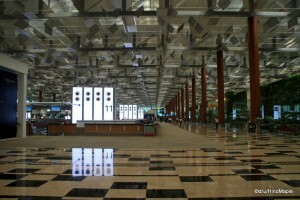 Singapore is well known for its airport, Changi Airport. It is touted as one of the best airports in the world, along with Seoul’s Incheon and Hong Kong. It is a very large, magnificent, and beautiful airport with 3 terminals and lots of things to do. It is also one of the strangest airports I have ever visited. Upon entering, the method of entry was pretty standard, however it was more American in the fact that I exited the gate and I was in the security controlled area of the airport. I walked past all of the duty free shops and straight to immigration where I had the typical passport check. I then proceeded past all of the luggage belts and out the door. There was no customs control for those who had nothing to declare and only one guard there. They didn’t take anything such as a customs card. This was also the strangest departure of an airport in my life. For my departure, I nearly had a typical experience. The check-in procedure was pretty straight forward. I had to get my GST rebate prior to checking in, but with everything prepared at the shop all I had to do was scan my barcode and that was that. I passed through immigration control very easily and I was extremely surprised that there were no security checks to get into the controlled area. In fact, Changi Airport only does security checks when you enter the gate area, which most people probably don’t know. The shopping at all 3 terminals are all very similar with almost nothing to differentiate the areas aside from the fact that each building was built at different times. The shops are all completely the same. I probably wasted a little time going to Terminal 3 to check out a few of the shops when I didn’t have to. I will say that the airport is one of the best I have ever visited, but an airport is still just an airport with nothing too special. 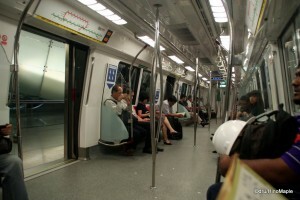 Inside the SMRT. The staff are as smart as Ralph Wiggum (s-m-r-t). Getting into the city is very easy. Some people take taxis which are affordable but I decided to take the train. A word of advice; be very aware of the limits of the IC card that they use. The EZ-Pass is very useful but the cost of it is not really worth it. I was surprised to learn that I needed a minimum $3 to use the train system and if you top it up with $10 just before going to the airport, you still have to wait 2 or so hours before you can get a refund on the balance. Plus, a refund means you forfeit the card, which I didn’t know at the time. Otherwise, the IC card and the train system is very efficient. Getting downtown, I stayed at Bugis Station, was very easy as Bugis Station is on the main line to the airport. There are buses that you can use to get around the city but they can be a little difficult to use as you have to calculate how far you need to go. With an IC card, there is no thinking. Just tap and go. It is no different than in other East Asian cities that also use IC cards. The other plus is that downtown Singapore is such a small area that you can easily walk around the city on your own. There is no real need to use public transportation unless you decide to head to Sentosa Island or to some of the more distant areas. Singapore is a very multi-cultural city. My impression that Singapore is a multi-cultural city could have been due to the Formula One Grand Prix that was happening at the time as well but from all of the workers and what appeared to be local people, I noticed a lot of different people. While Chinese people are the largest group, I saw a large and healthy group of Malays and Indians. This can easily be reflected in the architecture of the city. It is easy to see Hindu temples next to Taoist temples, mosques next to churches and so on. Many of these religious buildings are a beacon in their respective blocks as if to say that their religion is more important than the other, yet there seems to be a great respect for each other. I can’t say that this is true in real life but that was my brief view of the city at the time. The common language in Singapore is English, and while Chinese is the most widely spoken native language, it is not the common language. I have heard time and time again that Chinese will be the most spoken language of the world and that we must learn it in order to survive in business. I highly doubt that is true. While it is true that Chinese will become the most spoken language in the world, it won’t be the common language. People need a unifying language in order to communicate with each other and I think English will continue to be that language. If you ever visit Singapore, you will notice this easily. It is quite easy to notice that while speaking Chinese is an asset in communicating smoothly, Indians and Malays don’t speak Chinese or if they do it is very limited. Even if they did speak Chinese, there are many different Chinese languages. Hence English will continue to be the unifying language of the world and Singapore for the indefinite future. Singapore itself is an every growing country. You can see change everywhere you go. It is similar to Tokyo in that respect. Many of the older buildings are being torn down to make way for new high rises. 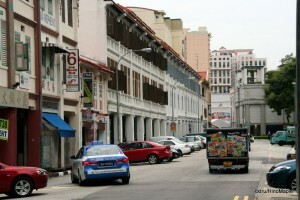 The central business district near the Fullerton Hotel is an expanding region. You can find many businesses there. You can see the huge development in the Marina Bay area with the new Marina Bay Sands hotel and the huge gardens that are being constructed behind the hotel. The entire area is undergoing its last push for development and should be finished in the next few years. While there are many new developments happening around Singapore, I also noticed that a lot of historical buildings are being maintained or restored. It is wonderful to see the Raffles Hotel and how it hasn’t changed much since it was originally built. It is great to see the old Fullerton Hotel as well as other historic buildings being maintained. There are also various buildings that are being modernized and restored. The Custom’s House complex was modernized while retaining the original façade. Even the famous Arab St. looks historical while being modernized inside the buildings themselves. It is an amazing sight to see and something I feel Japan can learn from. Singapore is a wonderful city/country to visit. I would love to visit this city again in the future. While it wasn’t a perfect trip, I was impressed by everything I did and everything I saw. It has the modernity of Japan with the historical feel of Hong Kong or Macau. It also has a lot of unique aspects that give it its charm. While I cannot tell whether my visit was influenced by the F1 event that was happening at the same time, I did thoroughly enjoy the visit. In the following posts on Singapore I will go into greater detail on the different areas specifically. 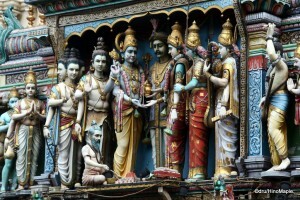 This entry was posted in East Asia and tagged Airport, Arab St., Arab Street, Changi, Changi Airport, East Asia, EZ Pass, F1 Grand Prix, Fullerton Hotel, GST rebate, Hindu Temple, IC Card, Malaysia, Marina Bay, Marina Bay Sands, Marina Bay Sands Hotel, Raffles, Raffles Hotel, Singapore, South-East Asia, Taoist Temple by Dru. Bookmark the permalink. Singapore, like the neighboring country Malaysia is not only multi-ethnicity but also have multi-nationalities living and working there. Both countries are quite dependent on foreign workers, skilled and unskilled. Blue and white collar. Sometimes, we locals would lament over the fact that our country is overflowing with foreign people and sad to say that it usually isn’t in a positive note. I’m sorry to hear it isn’t positive. I guess my suspicion was right. I figured that I had tourist “goggles” on when I visited. It is still a beautiful city/country. Reminds me of Vancouver in some ways. Vancouver is pretty tolerant to immigrants and people of various ethnic cultures and nationalities but you can’t rid the world of ignorance, at least not overnight. I’m happy to feel that Singapore is a “tolerant” country. PS: I have a lot more to say about my visit to Singapore. I hope you can provide some real incite into the region. I also hope to visit Malaysia soon. Most folks are tolerant but sometimes some issues will make the under-current tension rise up and mainly it’s about safety issues (any rise in crime is unfortunately be blamed on foreigners) and them taking up jobs from locals. Sometimes it’s not just about us not being tolerant of newcomers but newcomers not being able to understand the local culture too. Well, there’s always pros and cons when one have all these cultures clashing with each other and we all not being understanding of each other’s right. I think every country has that problem. Blame the crime on foreigners, as well as the loss of jobs. I don’t believe that as most immigrants actually help create jobs. They are just a scapegoat. I hope things get better over time. Maybe not perfect anytime soon but better.